ENCINITAS — As a piece of underground artwork surreptitiously installed on a city overpass, artist Mark Patterson never anticipated his mosaic to have become as relevant a part of the community that it has. Patterson created the “Save the Ocean,” or Surfing Madonna mosaic, as it’s affectionately known around the city, and installed it, along with friend Bob Nichols underneath an overpass on Encinitas Boulevard a couple of years ago. Since then, the mosaic has had to overcome challenges questioning the legality of the installation — done without permission on city property — people initially comparing it to graffiti, and having to find a permanent place for the piece once the city had it removed from the overpass. The piece has seemingly found a permanent home recently, across the street from where it all began. Through the nonprofit Surfing Madonna Oceans Project, which Patterson founded and serves as president, the piece has started to give back to the community as more than art. And so that’s how the idea for the Surfing Madonna Run came about. The inaugural race on Nov. 16 earned $78,000 and had just under 2,000 race participants. Of that amount raised, $50,000 of it was distributed back into the community. 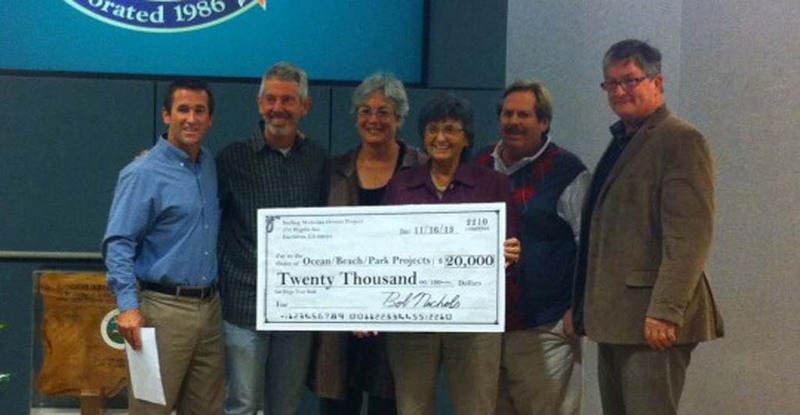 On Dec. 11 Patterson and Nichols presented the city with a check for $20,000. “We didn’t just want to write a check to the city of Encinitas, because who knows how much money actually goes to save the ocean. A lot of it might go towards paper and pencils, and then $5,000 go to actually saving the ocean,” Nichols said. The nonprofit told the city that they wanted the people to decide where the money went. On race day, the racers voted to have the money go towards several needs. That included the purchase of a $6,000 sea lion cage; another $6,000 will go to funding disadvantaged kids who want to participate in the Junior Lifeguard program next summer. This will be the first ever porpoise stretcher for the Encinitas Lifeguards. The nonprofit will use $8,000 to begin a recurring Surfing Madonna Oceans Awareness walk, a free guided tour, which is looking to begin sometime next March or April, Nichols said. During the summer they’ll also host a Moonlight Beach movie night free for families. Another $3,000 is going to the YMCA special needs program. And in July they’ll be fully funding a surf school for special needs kids. “They want to go to college also, they might not be A students, but they might be C and B students,” he said. “These are kids…that are trying to make a difference in their school or in their community; they’re actively engaged at school with other students, and they’re trying,” he added. A total of $8,000 was used as prize money for the race winners, and the remainder went towards merchandise and marketing the race, according to Nichols. Already the nonprofit is planning for the second annual run slated for fall. Their goal next time around is to raise more money and they’ll again turn to the participants for how the money will be spent. The event looks to be bigger, too, with more activities, including an art exhibit, sand castle building contest and swim contest along with the 5K/10K race. There are 10 board members, including Patterson, Nichols, Megan McCarthy, Chip Conover, Sheryl Bode, Bill Cavanaugh, Terry Van Kirk, Bill Caylor, Gordy Haskett and Polly Rogers.